The affectionate nickname of 'Tilly' came from an abbreviation of the more prosaic (and official) designation of the vehicle as Light 'uTILIty'. Broadly similar vehicles of this type were manufactured by four different manufacturers - Austin, Hillman, Morris and Standard. Superficially, those of the first three look more similar - the Standard vehicles had a more 'boxy' form with higher tilt and a completely different radiator shape. Following the release of TWO 1/35th Scale Austin Tillys from SKP and Tamiya, with the surprising scope of the Tilly (both in Color Schemes and Technical Details), there's a need for the data available to be put together for the modeler. The intention of Tilly Colours is to highlight the many and varied colour schemes applicable to Tillys during the war years. Indeed, the general colours here are equally applicable to other British military vehicles of the period. Tilly Colours is written by Michael Shackleton and Mike Starmer. Basic details are; Illustrated with eighty-eight wartime photographs and numerous drawings and unit badges. 80 pages, perfect bound, 18 cm square. The book is published through Blurb Publishing and retails at £15.95/$28.91. Michael Shackleton and John Simpson, have, for some considerable time, been running the 'Web-based Tilly Register (LINK) which acts as a clearing house for all things Tilly-Related. He also has worked on restorations of the actual vehicle. The recent model from Tamiya is based on technical data supplied by Mike. Mike Starmer has been investigating the obscure (and confusing) subject of British Vehicle colors for years. He has published several books on the subject and his work appears in many magazine and web articles. The book begins with an overall look at the history of the Tilly with development details of the vehicles of the four manufacturers. The introduction lays to rest (pretty definitively in my opinion) one of the 'Myths' which have developed over the years - the use of the AUSTIN Tilly in RAF service. 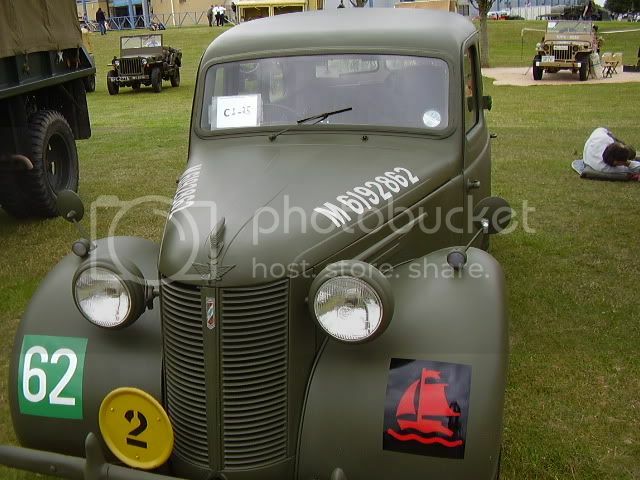 The MORRIS, may have served, in limited numbers, whereas the STANDARD & HILLMAN were on strength. The following section: 'Impressions of Wartime Tillys', is used by Shackleton to explain the process (and difficulties) of placing the Tilly in various Theaters of War. The key word here is 'impression'. As the author states: "...No-one had the time or inclination to record individual details of such lowly individual vehicles such as the Tilly". This is, in a way the essence and strength of the book. While it would be a mammoth (not to say impossible) task to document where all the various variants and marks of the Tilly ended up, it IS however possible, using the existing images, to start putting together a clearer picture of the kind of color schemes which would have been (typically) applied. This line follows through in the subsequent section 'Tilly Colours'. Mike Starmer's considerable research is applied by presenting a complete chronological list of the officially designated color schemes for Europe and the Middle-East as well as R.A.F. vehicles. Particular reference is given to the variations employed on Softskins during WWII and the immediate Post-War period. A series of Starmer's illustrations and charts are used to show 'Generic' vehicles which, though not covering Tillys specifically, are applicable as positioning of markings such as Bridge Signs were generally universal as was positioning of Unit Signs. Another valuable (and frequently overlooked) area covered within this section, is the painting of canvas tilts - once again, regulations were in place and changed according to time period and theater of operations. If the previous section sounds interesting in a strictly academic (albeit impractical way) the following section shows the absolute need for this chapter. 'Colour Mixes' is not about a series of War Office guidelines, it's about using actual model paint to obtain a close approximation of the actual color. Tamiya acrylic paint references are used throughout and are presented as being appropriate schemes for Tillys although many other Softskins will benefit from these charts. The Caunter Scheme. Modelers of a certain age will remember with something close to nostalgia, the original Tamiya Matilda and the unusual 3-tone scheme which it suggested. In two pages, the book covers the Austin Tilly in that very same scheme. Fortunately, the rather vivid R.A.F. blue has now been consigned to the dustbin of history and following Mike Starmer's work, it can pretty much be defined as BS 64 Portland Stone, BS 28 Silver-Grey and BS 34 Slate or Khaki Green G3. Now a Matilda, Valentine or heavy truck with this scheme looks pretty interesting - applying it to a Tilly is an incredibly tempting proposition! Now if Caunter is attractive, equally tempting is the 'Malta' or 'Rubble' scheme which the book also documents as applied to a series of Austin Tillys. Once again, references to colors are given. The following sections cover the various manufacturer's Tillys - Austin, Hillman Morris and Standard (in that order) with an ample range of photos along with corresponding notes on unit, chronology and any particular points of interest. Unit badges and Formation signs are also present as additional illustrations. Utility books of this type have to be considered both in terms of their utility (no pun intended) and the depth of coverage. In both these areas the book scores very highly. Taking utility as the starting point, it's easy enough to list a series of British Standard paint-colors it is considerably more helpful when the time is taken to present two pages of how to mix them. In decals, there are an increasingly large number of AM manufacturers who publish 'Generic' marking sets which include items such as Formation badges and appropriately sized numbers. The detail to be found in the photos (and the corresponding captions) allows the modeler to build a variety of vehicles from many different periods and theaters. Although 99.99% of this book is 'Tilly-centric' it should be seen also as a good source for color schemes for OTHER softskins of the period. Presentation. No matter how good the 'Raw' data is in any book, unless it's logically presented, whether chronologically, by variant or by subject, it'll confuse the reader. The presentation here is absolutely first class. Each of the four Tilly Manufacturers have their own section, and the photos are large and of good quality. A few are blurred, but considering their importance and rarity, their inclusion is necessary. Neither of the two photos of the 'Tilly Caunter' would win any prizes, considering they are the only two known images, their inclusion is more than comprehensible. For The Modeler. Considering how many Tillys saw service, considering they were in virtually every theater of war, the possibilities are enormous. Unfortunately, with only the Austin Tilly getting produced in 1/35th & 1/48th, options become a little more limited. The book caters perfectly to the modeler. The only thing which IS missing are 1/35th scale plans but, since this book is about Color & Markings, plans would be superfluous. Nor is the lack of color profiles any kind of handicap. Each of the photos carries VERY detailed captions which are as complete as the author's research can establish. The Authors. Putting two recognized authorities on complementary areas together for a book of this type is an extraordinarily good move. The results are there with a book which is well-written, informative and above all, incredibly useful. Hopefully this won't be the last collaboration between the two? The Tilly: a small vehicle but with an impressive history - it's nice to see coverage of a frequently overlooked subject. One out of Four?. Both SKP and Tamiya are to be congratulated for taking a gamble with a ubiquitious but (in a seeming contradiction) relatively unknown vehicle beyond Allied enthusiasts. It is unfortunate though that they BOTH did the Austin, There's a REAL need fo a Standard or Hillman in both 1/35th and (for Aviation enthusiasts) in 1/48th scale. It's a great start, perhaps now's the time for some other manufacturer to complete the circle? Highs: Specifically, dealing with the color schemes (considering its complexity) in such a complete and easily understood manner. Lows: Perhaps an addendum could be published later dealing with model paint from OTHER manufacturers? Our Thanks to Blurb.com ! Thanks for getting that one up James! For anyone getting any of the Tillys on the market, this one is an absolute must-buy. Unfortunately, the manufacturers need to go a little further and produce either a Hillman or Standard Tilly (which are VERY different from the Austin) and open up many more possibilities including RAF vehicles. I know it sounds crazy demanding more after we FINALLY get two Tillys in Styrene, but it really was an incredibly prolific series of vehicles. I know - unfortunately, they're beyond many modeler's budgets. That's why i'm so enthusiastic at SKP & Tamiya doing the Austin..